Medicaid is best-known as a program designed to help the neediest American families get the health care they need when they cannot afford it on their own. In recent times, however, the program has also become one of the major sources of funding for senior citizens who need assistance paying for the high costs associated with long-term care. In fact, Medicaid is now the single largest source for nursing home payments. Still, many residents in North Carolina know little about the program or how it can benefit them when it comes to paying for nursing home care. At the Potter Law Firm, we think that it is vital that seniors and their loved ones have the resource information they need to make informed decisions. One of the most important things for seniors and their families to understand about long-term care is that it is expensive. Room rates can be several hundred dollars a day, and that quickly adds up over time. The state’s Department of Health and Human Services has compiled a handy list of nursing home facilities in North Carolina that includes average daily room costs. You can also learn more about the state’s cost of care by reading the Genworth 2015 Cost of Care Survey North Carolina. If you already receive SSI, then you are considered eligible already. For other seniors, or residents who are disabled or blind, income must be below $973 per month for any individual senior. For households with two people, that limit is $1,311 per month. Some residents can qualify even if their income is above the eligibility limit, if their medical costs each month are more than the amount of income by which they exceed the limits. The Division of Medical Assistance uses a formula to determine a mandatory deductible that must be met before you can qualify for the program for a six-month period. You can contact the Division for help meeting these requirements by calling (919) 855-4100. You also must meet certain asset requirements. In North Carolina, you are not allowed to have more than $2,000 in assets. There are certain exemptions, of course. For example, your home is exempt from that limit, up to an equity value that does not exceed $543,000. However, your spouse or other dependents have to maintain residence for the home to be exempt, or you must intend to return to the home. You can also have one car, if it is being used by you or your dependents. Medicaid is administered by the state’s Division of Medical Assistance, or DMA. You can apply for the program by visiting this website portal. You can also apply by going to your county’s Department of Social services office. Finally, you can choose to download and fill out a paper application and mail it to the appropriate county. Not everyone who applies for Medicaid gets approved on the first application. Mistakes in filing, missed information, and other complications can all result in a denial of benefits. Still, that initial denial is not necessarily the final word on the subject. Since Medicaid is an entitlement program, you have certain due process rights. One of those rights is the right to appeal any adverse decisions made in your case. Read more about due process rights. Of course, many seniors find that they struggle to qualify for Medicaid when they need it most. They save and invest throughout their lives, manage to create a small nest egg for retirement – and maybe enough to leave something behind for their loved ones as well, and then find that the high cost of nursing home care threatens to consume everything they’ve worked for. Or perhaps their retirement accounts provide just enough income to deny them Medicaid, but not enough to adequately cover their nursing home costs. Medicaid planning can help to prevent those scenarios. When you begin Medicaid planning early, you can create a strategy that shields certain assets from program eligibility consideration, while ensuring that others are available for you and your loved ones to rely on during your retirement and beyond. These strategies typically require professional help, however, so that you can avoid potential pitfalls like the Medicaid five-year look-back provision – which can penalize you for asset transfers you make within the five years prior to any application for program benefits. Our Medicaid planning experts can help to guide you through the Medicaid planning process, and assist you with obtaining the benefits you need when that time finally arrives. We can assist you in the creation of a comprehensive plan that will ensure that many of your assets are protected when you do need to apply for the program – providing you with the eligibility and preserving a part of your estate for yourself and your heirs. 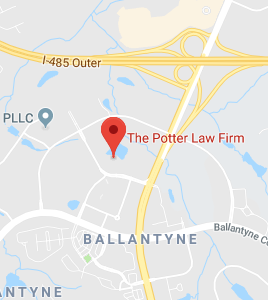 To find out how the estate planning and elder law experts at the Potter Law Firm can assist you with your Medicaid needs, contact us online or call us at (704) 944-3245 today.